Inkspiller - Are you a 'Rebel' Brand? Make Some Trouble! Rebel (also known as Outlaw, Misfit or Revolutionary) brands are rule breakers. They challenge the status-quo. They expose what isn’t working and then overturn it. Action-orientated, they bring fresh perspectives, new outlooks and inspirational change. They often attract a cult-like following of people who’ve lost faith in the more traditional choices and are attracted by the Rebel’s energy. Think of the Wild West, with its renegade law-breakers, and it should be no surprise that the Rebel is often seen as a quintessentially American archetype, tying in to the nation’s notion of freedom driven by strong leadership. The Rebel is not just for macho, chest-beating brands though. The Rebel can have strong links with the Creator archetype, creating an ‘Artistic Rebel’ brand personality. Remember Apple’s iconic ‘Think Different’ campaign (and even of Steve Jobs himself, famously disruptive and difficult) and its tribute to ‘the crazy ones. the misfits. the rebels. the troublemakers’. In fact, this can be an ideal archetype for an emerging brand- as Apple were at that point in time- enabling newcomers to make their mark within a crowded industry by disrupting it. Something we talked about in this previous post on brand positioning; "What if you’re not No.1 in your industry?" Mission: To gain radical freedom via revolution. Values: Leadership. Risk taking. Bravery. Brutal honesty. Personality attributes: Candid. Raw. Challenging. Honest. Iconoclastic. Characters: Follow the link to our Pinterest Board of Rebel characters from TV, flim and literature. How can we express our Rebel identity? 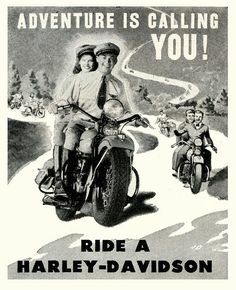 HARLEY DAVIDSON is the classic rebel brand. 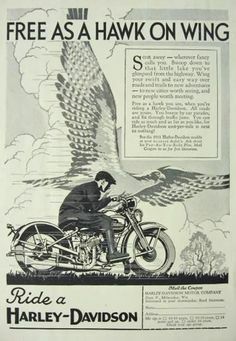 It was first positioned as an outlaw counterpoint to the ‘American Hero’ over a century ago (click here and here to see some ads from the 1930s) and emphasise this long-held status with the ‘Notorious since 1903’ tagline. They’re also a great example of the way in which Rebels attract a cult following. Many thousands of fans in the USA have had the logo tattooed all over their bodies. Would your fans tattoo your logo on their back? That’s the power of the Rebel and the power of building a strong brand. It’s also a reminder that people don’t buy from you because of what you say about yourselves but because of what buying from you says about them. Which ironically is a challenge for Harley now that their core fan base is aging and younger generations consider them the brand for "old, white guys". LUSH is another notable Rebel and an interesting company in many, many ways. They pair a Jester-like identity of irreverent, downright zany elements such as bizarre product names (‘Shark Infested Custard Body Oil’ anyone?) and eccentric staff with a seriously rebellious side, literally offering up their shop windows as live petitions for the causes they care about. Taking the Rebel’s use of raw, candid imagery to a new level, their 2008 Sea Shepherd campaign saw performance artist Alice Newstead (who our own Alice remembers fondly from a past life) hung by shark hooks through her skin their Regent Street store. View the video here if you aren’t squeamish about such things. They went a step further in 2012 with an extraordinary ten hour performance within which Jacqueline Traide was subjected to brutal ‘animal testing’ procedures. You can view that video here - but be warned, it is disturbing stuff. Lush’s fanatical level of commitment to their animal rights campaigns is incredible when you remember that they are a company that sell soap and bubble bath! Unlike the macho world of motorbikes inhabited by Harley, they are even more rebellious because they exist in such a fluffy, often bland, marketplace. Many other cosmetics companies make much of their ethical credentials (The Body Shop, for example) but none have put their money where their mouth is in the same way. It’s no wonder they’ve captured the world’s imagination and grown quickly with very little advertising at all. Not sure if your brand is a Rebel? Don’t forget that your brand is probably a mix of two or three archetypes. We’re going to be exploring all of them over the next few weeks. So do please sign up on the right and we’ll be sure to keep you updated. Not just on Archetypes but other creative ways to bottle your brilliance and build your brand.